And Kathy Aaker of Riverweave Studio. As always it is great to share the projects we have been working on and see what others are accomplishing in their studios. 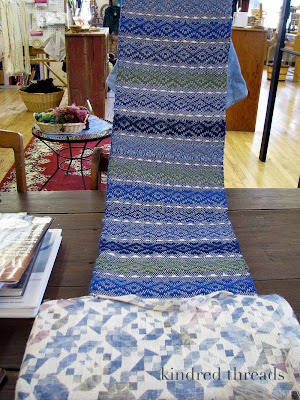 Kathy came with a beautiful wool and linen runner that she is putting a Damascus edge on. Those are Kathy’s elbows behind her lovely runner, in the picture above. She came toting a cement block to hold down the runner while she works on the edge. Last time, Susan came with her own special brick also. Makes me think that I’d better dig a brick out of my long dead herb garden and make my own “weavers brick”. One more notch on the belt of becoming a true weaver. Jan has finished her reconstructed rag rugs (beautifully done), and we are excited to see what her next project will be. Phyllis Scarbrough joins our studio group as our newest member; a basketmaker and teacher extraordinare. We are so happy to have her as part of our studio, I will do a more complete introduction of Phyllis soon. 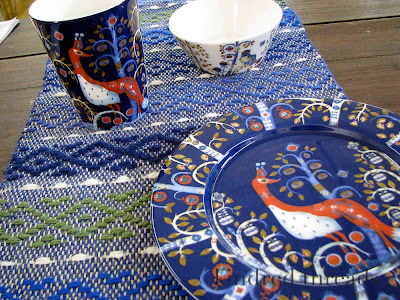 that seem to go perfectl with Kathy’s table runner. One of Joyces’ beautiful scarves with the beginning of a star that Phyllis is weaving. These also seem to belong together. 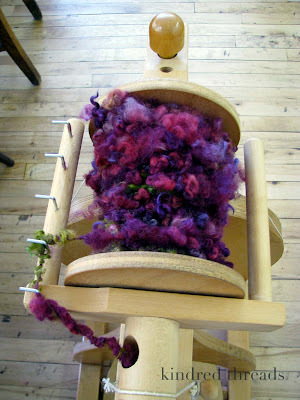 Some crazy wild yarn I am spinning on Kathy’s Clemes and Clemes bulky spinning wheel. This thing treadles like a tractor but between the huge bobbin and 1 inch or bigger orifice; I think that I could shove an elephant through it. Fun! 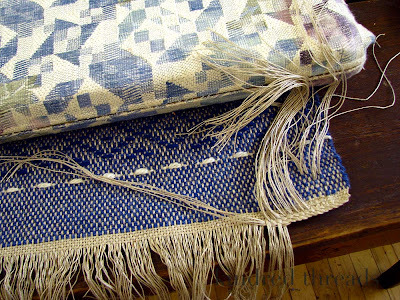 Love your collective studio creations and the occasional photos of visiting weaver’s work; never ceases to inspire. Is there any chance of a series of photos showing how the Damascus edging is constructed? I do have a line illustration in a book, however studying the process via a series of photos is almost as good as watching the weaver at work in real time. I think it is so wonderful to have a sharing group like you have. I am envious! Thanks Peg and K. Wish you were both close enough to stop in. 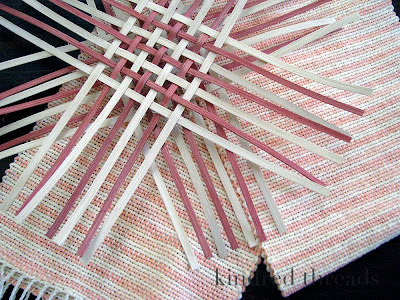 We find constant inspiration in each other as as weavers and as friends. I will see if Kathy is interested in posting pictures of the damascus edge as I am yet to do it.